The village representatives have been doing tent sit-in in protest to the unjust navy lawsuit since April 10th despite the police threat on the first day. For more, see here and here. This weekend, our village is honored to host the 1st International Peace Film Festival in Gangjeong (April 23 to 26). Unfortunately, we also find ourselves in grave danger and need your urgent help. Although our peace movement has been recognized internationally as an “exemplary non-violent struggle” by organizations like the International Peace Bureau and Veterans for Peace, we are currently struggling for our very survival. We are asking that these be sent ideally during Aug 26-30th, the launch period for this protest. 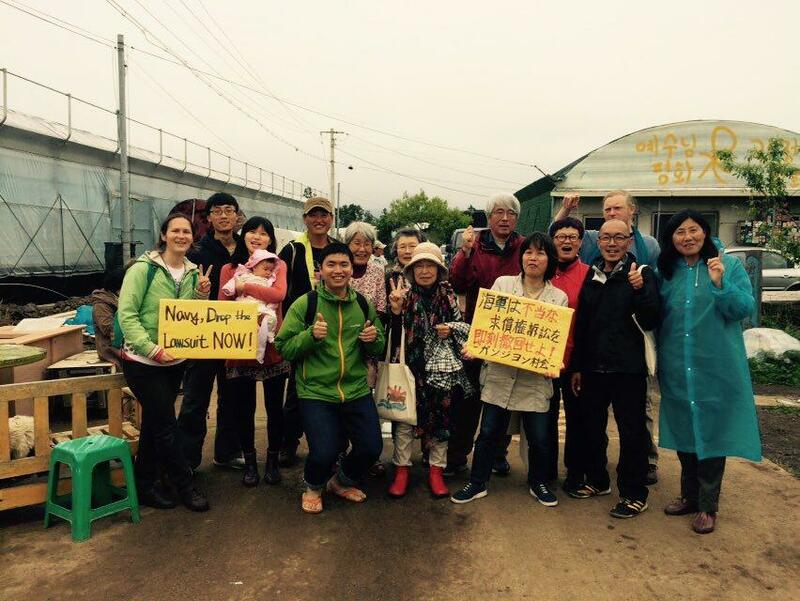 Also, if you have not done so, please join No Naval Base on Jeju on Facebook for more updates and information, or visit savejejunow.org. 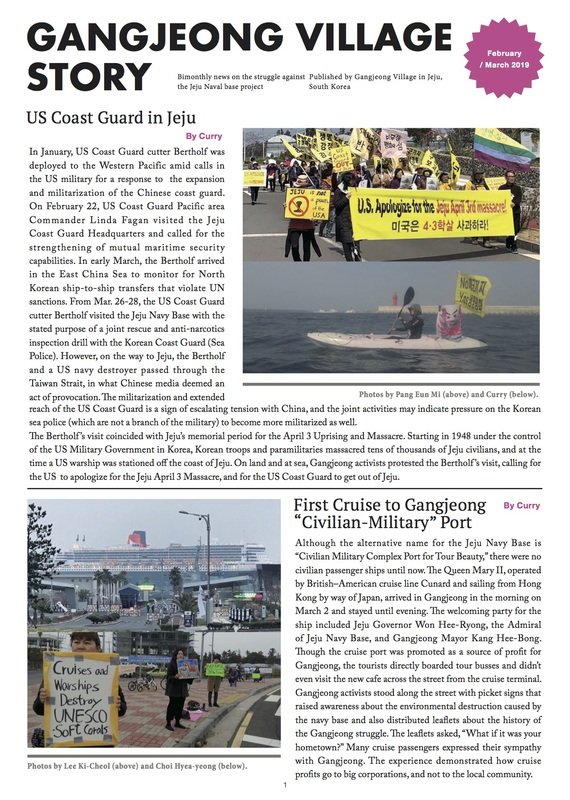 The reasons we chose April 26th: It symbolizes the overturning of democratic processes that the navy had used in order to create a cover story for building the base. On that day in 2007, it organized an ad hoc general meeting among a tiny fraction of the residents to make the deceptive claim that the village approved the base. In protest, the villagers responded by holding their own plebescite four months later, when 94% of more than 70% electorates of the village population voted to oppose the base project*. However, the government has never recognized the village’s legitimate democratic vote. Instead it relied upon the fraudulent “approval process” that took place on April 26, 2007: Not only was there anti-democratic voter-suppression, with no advance publicity or public discussion, there was not even a vote; instead, approval was absurdly measured by clapping. By bringing attention to the anniversary of this date, we seek to emphasize how the base has been forced upon the village through lies and repression despite overwhelming popular opposition to it. The date is also the last day of the 1st International Peace Film Festival in Gangjeong. 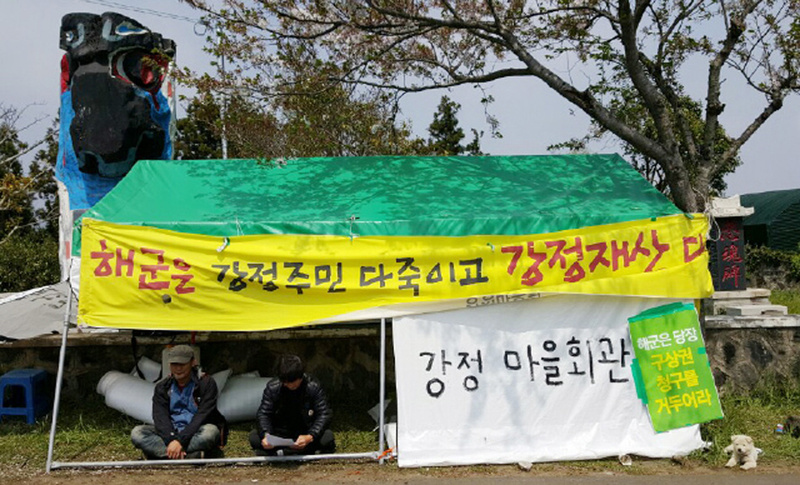 For our April 26-30th protest campaign, the key message is that: (1) the lawsuit against Gangjeong is wrongful; (2) the navy’s lawsuit must be dropped (3) Also, we denounce the history of unjust measures that have been used to install the base. We greatly appreciate your time and apologize for the very short notice. Thank you always for your solidarity. We have learned that your government, the South Korean Navy and Samsung Construction division are currently demanding damages from local groups and residents on Jeju Island for the alleged costs incurred due to the residents’ opposition to the Navy base construction: US $2.9 million. Your government has listed the Gangjeong village association, five groups and 116 residents and activists as the defendants. The insistence that the construction delay was caused by residents is groundless. There are multiple complex reasons for the delay in the construction schedule. The principal reasons include disputes and controversy over the legality of the work, suspension orders issued over illegal construction work, losses and damage to structures caused by the natural environment, the strong wind and waves of Gangjeong’s coastline, Typhoon Bolaven, Typhoon Neoguri, etc. It is sophistry and exaggeration to claim that the residents blocking construction vehicles from entering and leaving the base for only a few minutes at a time caused the delay. The responsibility lies solely with the state for threatening citizens’ right to a peaceful existence and causing their pain by enforcing this wrongful government policy. There is no one else as responsible for this as the government. The state rather than the residents bears the responsibility. Without mentioning a word about their own responsibility, it is the height of irresponsibility for the state to shift the blame for the delays in the construction onto individual citizens. The state that should be protecting the basic rights of its citizens is instead declaring war against them. The biggest crime of all is that the ROK government and the Navy rejected the will of the Gangjeong villagers and have destroyed a 500-year old community. In addition the environmental ‘special preservation area’ is being destroyed as well – violating your own government’s environmental protection designation. Our international membership stands with Gangjeong villagers and we demand that these outrageous and illegal charges be immediately dropped. We eagerly await your positive response. We also thank St. Columban Missionaries in Britain for its protest letter this April. See here.